The cableway system is a classic cable car with automatic and mono-cable clamping with closed vehicles, with a capacity of 8 people with ski inside to minimize the problems of boarding and disembarkation and at the same time ensure a high comfort of transportation. The cable car has a transport potential of 2480 people an hour at the maximum speed of 6 m per second and with 40 vehicles in-line. The line was built with positioning of 11 conventional supports made everyone of a steel central stem. The valley station incorporates a multistorey car park which is spread over 4 levels that can accommodate 313 cars, a private car park with a capacity of 34 parking spaces, offices of the shopkeeper society, ticket office and services. On the lower level, a wide pedestrian tunnel allows access to the base of the stairs and lifts. Three high-capacity lifts connect all levels up to boarding floor of the cable car. The entire work was conceived with the objective of harmonizing the intervention with the urban and natural surrounding environment. The multistorey car park including access, exit and pedestrian paths are "virtually"
A footpath, that passes above the service road to the village of Dolonne, connects the slope with the boarding floor of the cable car. 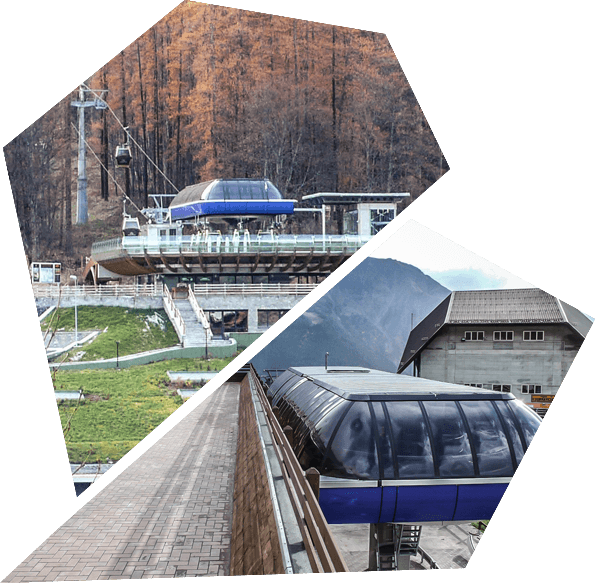 The mountain station has a suspended fixed engine and is located on the eastern side near the arrival area of the “giant” cableway of Courmayeur. In addition to vehicle warehouse it contains services and rooms dedicated to electrical and mechanical maintenance men of the shopkeeper society. This part of the work is realized to a large extent underground to minimize the impact on the environment.